Much like musical notes make up a song and various shades of colors turn into a painting, fragrance notes are necessary to make a perfume. Overall, there are three note scales that when blended together create the perfume's fragrant accord. Each of these levels, however, has its own primary purpose. Assigning order to things helps us to avoid chaos. And so it is with fragrance. Like all of us, fragrances can be broken down into their own categories or family trees. Instead of sharing a blood line, however, fragrances may share notes, accords or other characteristics that define their overall similarities. "But it's all a matter of taste, you say. It's true that among the perfumes reckoned good or great, there are some that will move you more than others, and some that will leave you entirely cold or even sickened, because either they won't say what you're longing to hear or they say what you never want to hear again. All the same, when considering perfume as an art, it's possible to appreciate when something is done exceptionally well." -- Tania Sanchez, scent addict and co-author of "Perfumes: The A-Z Guide." It may seem as simple as blending a few essential oils with water and alcohol, but the true art of creating a lasting -- and phenomenol -- scent is much more than that. It is indeed a science, one defined by the usual logistics of mixing ingredients in a laboratory, but if done well the perfume becomes less about the science and more about the creative synergy of the notes. Perfume has been around for thousands of years. Frankly, the history of making perfume is less interesting than the fact that new fragrance notes are still being created everyday -- from plants, trees, herbs, spices; notes inspired by water, air, metal, earth and even burnt rubber. 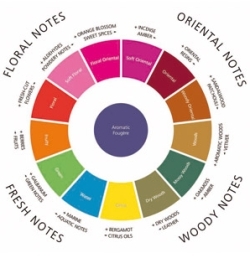 The fragrance notes we find in perfume get more unique as time goes on. And, with advanced technology, we are able to manipulate more and more of the elements to create scents to our liking. The Egyptians began mixing perfume centuries ago. Essential oils are mixed with water and/or alcohol at varying concentrations to make the perfume. (See our article on the difference between eau de toilette, eau de parfum and perfume for more on concentrations.) These essential oils are extracted from plants, herbs and spices like cedarwood, lavender and cinnamon. Essential oils are extracted from plants one of two ways – either by steam distillation or expression, also called pressing. Distillation is the most prominent method used to extract aromatherapy oils, however. This technique involves steaming the plant matter until it breaks down. The byproduct of this breakdown phase is the plant’s fragrant oil, which is cooled, separated from the water and finally filtered into its pure essential oil. Chanel No. 5 was the first man-made, or synthetic, perfume created. A synthetic perfume is made using organic compounds that create alcohol when reduced. Synthetic oils are artificially produced to mimic natural odors. Common aroma chemicals include benzyl acetate, ethanol and limonene. Oftentimes aroma chemicals last longer and are stronger than those that occur naturally. Essential and synthetic oils can be blended together to create different scents. These oils are divided into top, middle and base notes. The top notes are the fragrance notes you smell as soon as the perfume is sprayed. The middle notes come second, followed by the longest lasting of the three, the base notes. Base notes are often heartier essential oils, like cedarwood, sandalwood, vanilla, amber and patchouli. Once the essential oils are blended, they are diluted with water and/or alcohol to lessen their concentration. Then there is a waiting period; anywhere from 48 hours to several weeks depending on the strength desire of the perfume. Eau de what? Toilette? Parfum? Isn't it all the same? OK, so what is the difference between an eau de toilette, eau de parfum, and perfume – other than the price? These distinctions are more than just a fancy way to label fragrances; they represent the actual concentration of the scent, with an “eau,” or water, generally being the lightest (and often less expensive). Watch an exclusive perfume.org video on the differences here!